“It’s big,” said Mars Exploration Rover team member Ray Arvidson. And at approximately the size of a beach ball, about 2 feet wide, it is the largest meteorite fragment found so far on Mars. The Opportunity team spotted the rock, now known as “Block Island”, during the rover’s travels across the dunes of Meridiani Planum. Turning Opportunity around, they had the rover backtrack the 800-or-so feet to investigate closer. Data gathered over the weekend by the rover’s Alpha Particle X-Ray Spectrometer confirmed that the rock is, in fact, an iron meteorite. Although covered with the ubiquitous red Martian dust the meteorite’s telltale shiny metallic surface is visible, distinguishing it from other rocks in the area. 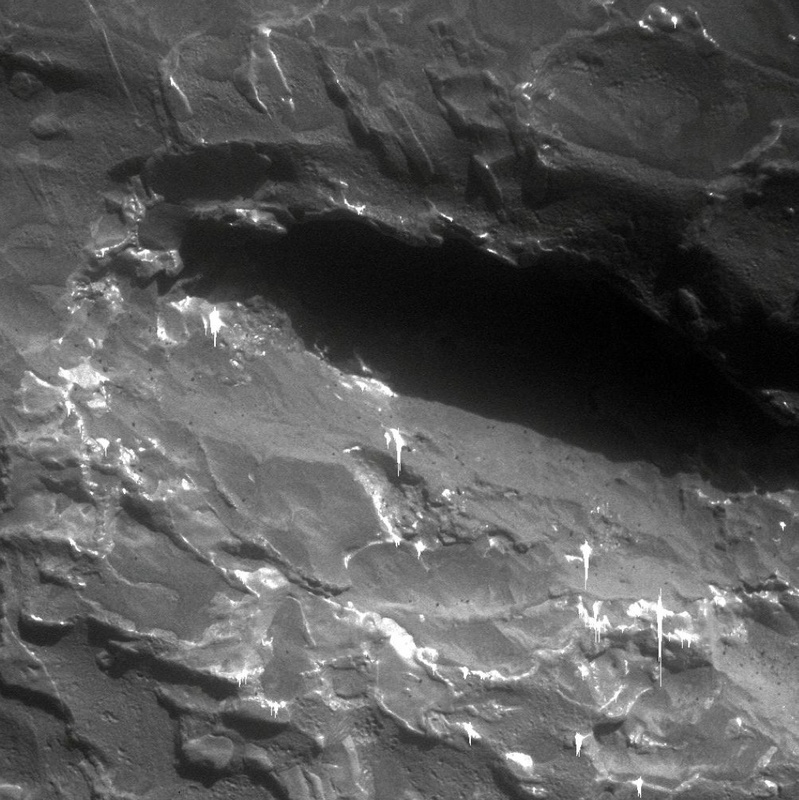 Other iron meteorites have been found on Mars by the rovers, but this one is the largest yet. 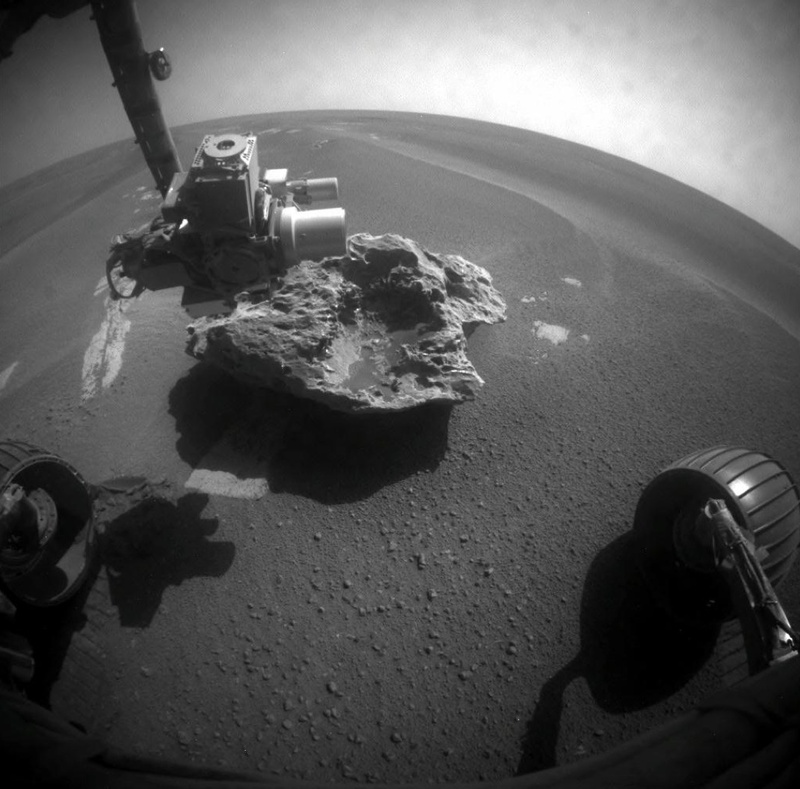 It may have been a part of the larger meteorite that created Victoria Crater, Opportunity’s 2006-2007 mission objective. Whatever it is, it’s been sitting here for a while…it is assumed to have landed on Mars at some time within the past 3.5 billion years. “It would [have] hit the ground at a very high velocity – high enough to completely fragment and melt rocks of this nature,” says NASA planetary scientist Albert Yen. More studies of Block Island are planned to see how much weathering it has undergone, and what the effects are. Being composed of iron, the amount of rust present could hint at how much water, if any, it has encountered either on its way through the Martian atmosphere or while on its surface. Who knows….it may have actually have landed in one of the shallow lakes that are thought to have once existed in this region of the red planet. Read more about this on NewScientist.com.